Less than 3 miles from Chattanoogas Lovell Field Airport, Red Roof Chattanooga is within 5 minutes of Hamilton Place Mall and golf courses. McCallie School, Lake Winnepesaukah Waterpark, and the University of Chattanooga are all just a 10 minute drive. The Childrens Discovery Museum and the Tennessee Aquarium are just 15 minutes form this hotel, and breathtaking Ruby Falls, Lookout Mountain, and Rock City are just a 20 minute drive away. Red Roof Chattanooga is within walking distance of many restaurants. 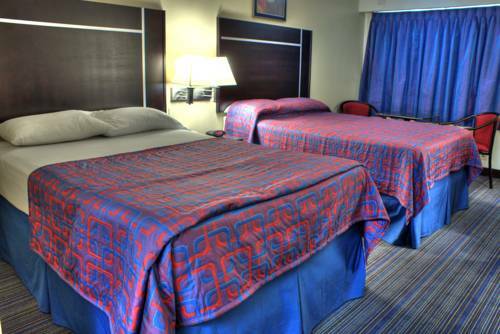 This Red Roof Inn Chattanooga Airport is conveniently located within walking distance of many restaurants, 1 mile from Hamilton Place Mall & less than 3 miles from the Chattanooga Metropolitan Airport. This Inn is located only 11 miles from all of downtown Chattanooga's great attractions! Funicular railway opened as an attraction in 1895. It's like riding an elevator up the side of a mountain, on a train. A 145-foot-tall waterfall under the earth -- dramatically bathed in unnatural light -- is the centerpiece of this cave attraction. The Civil War battles for Chattanooga are recreated on a map that was built in 1957, updated with 3-D projection multimedia in 2016. Atom Age museum embraces energy alternatives, but also has replica A-bombs and a memorable zombie cam.